1. 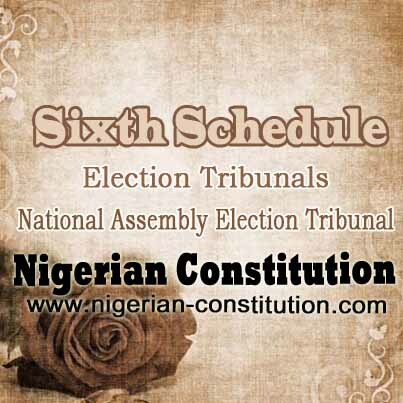 (1) A National Assembly Election Tribunal shall consist of a Chairman and four other members. (2) The Chairman shall be a Judge of a High Court and the four other members shall be appointed from among Judges of a High Court, Kadis of a Sharia Court of Appeal, Judges of a Customary Court of Appeal or other members of the judiciary not below the rank of a Chief Magistrate. (3) The Chairman and other members shall be appointed by the President of the Court of Appeal in consultation with the Judge of the State, the Grand Kadi of the Sharia Court of Appeal of the State or the President of the Customary Court of Appeal of the State, as the case may be. If you enjoyed this article please consider sharing it. Like and follow us on Facebook & Twitter! Speech By The Senate President Dr. Abubakar Bukola Saraki, At The Senate Ad-HOC Committee On Constitution Review – 17th June, 2016. Nigerian Constitution Free Download (PDF - For Mobile & Desktop) - Download Nigerian Constitution, Free, For Desktop & Mobile.